The pyloric stenosis in children is congenital narrowing of the pyloric; in rare cases it is acquired (cicatricial stenosis caused chemical burns or ulcers of the stomach). The disease often marked boys. The main symptom is vomiting, which appears on the 2-3rd week of life. Vomiting rich, "fountain", the number of vomitus, as a rule, exceeds quantity of milk taken by the child during feeding. Impurities bile vomit mass no. At the beginning of the disease vomiting occurs in 10-15 minutes after feeding, but further expansion of the stomach intervals between feeding and vomiting are extended. Due to persistent vomiting develops exhaustion and dehydration. The weight of the child is 1,5-2 months is often smaller than at birth. The number of urination and the amount of urine in the pyloric stenosis is reduced, more frequent constipation. During examination of the abdomen in most cases, you can watch the motility of the stomach in the form of "hourglass" (Fig. 2). This symptom is very important, can be caused by stroking the skin of the abdomen in the stomach. To accelerate the emergence of peristalsis may also, giving the child a few SIPS of water. In doubtful cases resort to the x-ray examination of the stomach. In laboratory studies reveals an increase in hemoglobin and slowing ROHE (due to dewatering and thickening of the blood), as well as reducing the number of chloride in the blood as a result of loss of hydrochloric acid with vomit. Fig. 3. Peloritani by Fred - Ramstadt: left - cut serous-muscular layer (the edges of the cut apart); on the right, the place of the cut. Differential diagnosis mainly should be carried out with the pilorospazm (see). Certain difficulties in the differential diagnosis is pseudophilotes - a disease which is based on endocrine disorders (see Adrenogenital syndrome). Treatment pyloric stenosis only online. The operation is shown as soon as the diagnosis is in laparotomy and the dissection of the muscular layer of the gatekeeper to the mucous membrane (Fig. 3). Feeding begin within 3 hours after surgery expressed breast milk by 10-20 ml in 2 hours. In the following days for each feeding add 10 ml To his chest start to apply from the 4th day, but the basic continue feeding expressed breast milk. On breastfeeding translate from 7-10 days. In severe cases, pyloric stenosis in the first days after the surgery, intravenous 5% glucose solution, izotoniceski solution of sodium chloride, and re transfusion of blood or plasma. After surgery, the children develop normally. 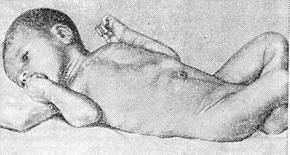 The pyloric stenosis in children (pylorostenosis; from the Greek. pyloros - doorman and stenosis - the narrowing) is a disease of children of the first months of life, having clinic partial obstruction of the stomach. The etiology and pathogenesis of the disease to date not been studied. In the basis of pyloric stenosis lies congenital disorder wall gatekeeper and again acceding nervous spasm. Fig. 1. 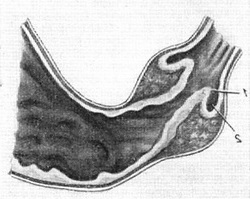 A longitudinal section through the pylorus with pyloric stenosis (Ladd and gross): 1 - "spur", formed by protrusion gatekeeper in the duodenum; 2 - pocket mucosa. Pathological anatomy. The pylorus of the stomach in the pyloric stenosis sharply thickened, increased in size, has a characteristic appearance olive whitish cartilaginous consistency. The lumen of the pylorus sharply narrowed, barely missing pugovicy probe (Fig. 1). Microscopic examination mark thickening of all layers of the wall of the pylorus (muscle, slimy, submucosal), excess of connective tissue, the large size of the muscle fibers and their nuclei, significant changes in the nerve plexus and ganglion cells walls gatekeeper. The clinical picture tacit pyloric stenosis characteristic. The child, born in time, with a good weight, with 2-4 weeks of life vomiting "fountain" almost after each feeding. Vomit, not containing bile, thrown with great force in the form of a flying jets. In some cases, vomiting precede regurgitation. Gradually vomiting is becoming more rare, but plentiful. Vomit have sharp, sour smell. There is a delay of a chair, sometimes self scarce chair greenish color, resembling meconium ("hungry" chair). Urinating child rarely (5-b and even 2-3 times a day), in small portions. Weight quickly falls. The skin becomes soft, dry, lose turgor, hanging on the limbs folds (Fig. 2). Through the thin covers the abdominal wall is clearly visible expressed motility of the stomach. For the blood characterized by relatively high levels of hemoglobin and red blood cells, low ROHE (1 - 3 mm per hour), which indicates that the thickening of the blood in the result of dehydration. In biochemical studies of blood find an increase in reserve alkalinity of the blood, reducing the number of chlorides, hypokalemia, the signs of which are identified on ECG in the form of extension, flattening, sometimes deformation wave So Gipohloremichesky coma (yawning, shallow breathing, muscle hypotension, drowsiness, dizziness) is rare. Diagnosis of severe forms is easy. There are, however, such forms, where diagnosis is difficult, requires great powers of observation, thoroughness in the collection of anamnesis. For further diagnosis applied radiological examination of the stomach with barium (2 chain. L. barium 50-60 ml of expressed breast milk). X-ray diagnosis pyloric stenosis in the early stages of the disease is based on the deep categorizes motility of the stomach, lack of early gastric emptying in the first 15-20 minutes after taking barium, save the remainder of barium in the stomach to 24 hours. In the later stages of the disease to these symptoms extension is appended to the stomach. In the differential diagnosis pyloric stenosis greatest practical importance pilorospazm is a disease similar in clinical presentation to the point, but with pure neurogenic origin and respond to medical treatment. When pilorospazm vomiting begins from the moment of birth, less abundant, unstable by the day, in vomitus meets the admixture of bile. Weight loss, violation of defecating and urinating less pronounced or even absent. Visible motility of the stomach is rare. Forecast P. with timely and proper treatment usually quite favorable. In the absence of timely treatment of children perish for 4-5 months. life from exhaustion and again joined complications (pneumonia and other). Treatment. The only correct method of treatment pyloric stenosis at the present time should be considered surgery. Operation is carried out within 1-3 days after diagnosis. Too large depletion of the child should not be a contraindication for surgery, because without it these children are doomed to destruction. In severe malnourished patients is mandatory preparation for surgery, which consists mainly in the restoration of water and salt exchange. Within 2-4 days the child should be 2-4 transfusion of blood or plasma in the amount of 10 ml per 1 kg of body weight; intravenously, subcutaneously and klizmah impose solutions periods, physiological and 5% glucose. A day, a child should receive not less than 500-600 ml of liquid. In the presence of concomitant diseases (pneumonia, otitis) prescribe antibiotics. On the eve of the operation, the child is given a blood transfusion, shared bath, with 12 hours of the night is not fed and not watered. In this system, feeding stomach before surgery is required. The least dangerous method of anesthesia is local anesthesia 0.25% solution novokaina. The best approach to the stomach and the gatekeeper routed through the middle section from the xiphoid process of the sternum length 4-5 see If you think the cut liver prevents eventuali intestines. Peloritani (operation dissection gatekeeper) by the way Fred - Ramstedt (extremecopy pyloroplasty) is a longitudinal cut serous-muscular layer gatekeeper for avascular line (Fig. 3). The mucous membrane is not opened. After you cut the wound edges gatekeeper pushing forceps until the release of the mucous membrane and bulging in her wound gatekeeper. Bleeding is usually insignificant. If there much of a bleeding vessel cut away his catgut at all the needle and bandaged. The wound edges gatekeeper not sew. The integrity of the mucous membrane should be checked by squeezing the contents of the stomach towards the duodenum. When wounded mucosa her sewn catgut. On the peritoneum, together with the aponeurosis impose hub kedgotoline seams with the addition of 2-3 silk. The skin is sewn continuous blanket ketotofin seam, which promotes better hemostasis. After surgery produce a blood transfusion. 2 hours after the operation, the child receives 10 ml of 5% glucose solution, even after 1 hour (3 hours after surgery) begin feeding expressed breast milk every 2 hours with the 6-hour night break. Dosage of milk for one-feeding in the first day is 20-30 ml; if the injured mucous membrane or vomiting quantity of milk is reduced to 5-10 ml every day daily dosage of milk increased by 100 ml With 5-6 nights in the absence of vomiting child 2 times in 5 minutes to the breast, and with 7-days translate into breast-feeding after 3 hours. In the postoperative period it is necessary to combat dehydration, exhaustion and a violation of salt exchange. All clinical and radiological pyloric stenosis symptoms disappear within a short time after surgery. Remote results of surgical treatment good: children properly developed, have no disorders of the gastrointestinal tract.